GE knows that the future of our homes is a wired world in which our appliances can wirelessly connect to the Internet and interact with us in ways that will, supposedly, add convenience and joy. That is the promise of the much-vaunted Internet of Things, a trend that will have our refrigerators, toasters and more connecting with us, and with each other. To that end, the company has taken a stake in Quirky, a small product maker that re-imagines whimsical things for the kitchen and home. 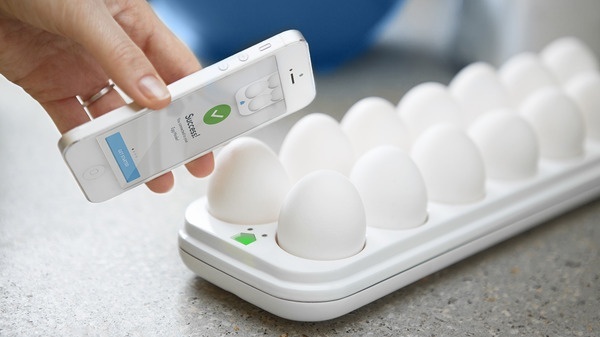 The first four products in their line are Egg Minder (pictured), a "smart" egg tray that let's your mobile device know how many eggs are left in the fridge and how fresh they are; Pivot Power Genius, a flexible power strip that can be turned on and off with a mobile device; Nimbus, a four-dial desktop device that looks like a car dashboard that can be personalized to display information like the number of emails in your inbox and new tweets on your Twitter page; and Spotter, a wireless monitor that can alert you to motion, sound, light, temperature, and humidity for telling you when your wash is done to any other reason you can think of.